Parents Wonder: Why So Much Homework? As the movement against excessive homework continues to grow, some parents say they're drawing a line in the sand between home and school. Schools, in turn, are starting to rethink the role of homework and how it should be assigned. If homework serves simply as busy work -- proof that kids are "learning," then that time is wasted, some say. Parents are sensitive to pressures on their children and want them to have down time when they get home from seven hours in school. If the work isn't stimulating, then why do it? “I just think that schools need to be a little more thoughtful about their policies for homework and work with the teachers to make sure that whatever homework that they do assign are rich, valuable experiences for the kids, and will actually be corrected,” said Jolene Ivey, mother of five boys in a discussion on NPR's Tell Me More. “We’re teaching to the test, so a lot of the instruction that should be going on in the school environment is not there," said Stephen Jones, an educator and a father. “Giving homework gives them an additional opportunity to give them work.” He doesn't necessarily think that’s the worst thing, but he said homework should allow different learning styles to flourish so that it’s both more motivating and more fun for kids when they are at home. Proponents of homework say that the ability to buckle down and focus on homework after a long day is a key skill that young people will need in college and beyond. If high schools don’t assign enough homework, graduates will be unprepared when they confront heavy work loads in college. But Kenneth Goldberg, psychologist and author of “The Homework Trap,” argues that success in college is due more to self-confidence. He argues that homework highlights "under the radar" learning disabilities in children that make it much harder for some to finish work at home. One of his children struggles with homework on a nightly basis, leading Goldberg to conclude that homework batters the struggling child with negativity, challenging his self-confidence instead of nurturing it. Goldberg has a few simple solutions to offer parents and teachers about how to avoid the homework trap and increase productivity. He promotes the idea of designating specific amounts of time to homework, regardless of whether the project gets done and then discussing a different set of expectations with the school. 1. Time-bound homework. 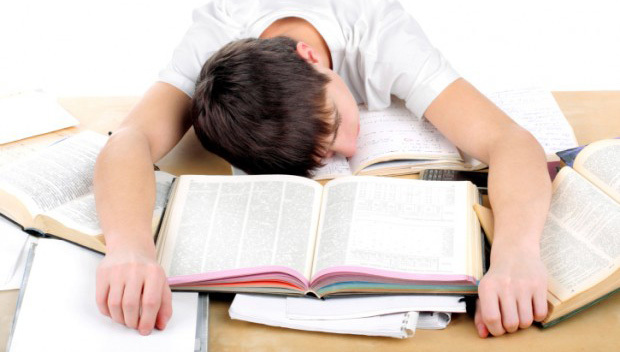 Just like school starts and stops by the clock, define homework as a fixed period of time. See what the child can do in a reasonable amount of time and work with that child on using the time well. 2. Reduced penalties. Zeros factored in 25 percent of the grade is too harsh of a penalty to alter behavior. Lesser consequences will prove more effective in both mobilizing the child and allowing the parent to approach the issue calmly. 3. Respect lines of authority. Teachers are in charge of their classrooms. Parents should tread lightly when it comes to telling them what to do. Parents are the people in charge of their homes; teachers should not tell parents how to organize their homes. Ultimately, when decisions are to be made about behaviors in the home (i.e. homework), the parent needs to be the one with the final say. “Teachers should recognize that parents are the head of the home, teachers are the head of the classroom, and that homework is given with the permission of the parents,” Goldberg said. For parents like Ivey, who want their kids to succeed in school, the homework conundrum has become inescapable.